It's been a couple of months since Parker made an appearance on this little blog, so what better time than the present to have a "Boy Behind The Blog" post? Naturally, it is Christmas themed. So take it away, husband! Throwing it back to our first married Christmas in 2011! 1. What's your favorite Christmas tradition? Heading home to see family... looks at me and says, "if I was to guess yours, it'd be eating" Seriously, how does he get away with saying this stuff? Rude. 2. What's your favorite Christmas gift you've ever given? Probably the Benjamin Knox paintings I gave Chelsea, but I also really enjoyed the angel tree gifts we picked out this year. These paintings are some of our favorite items in our home! Parker took elements from the one on the left and incorporated them into his proposal. 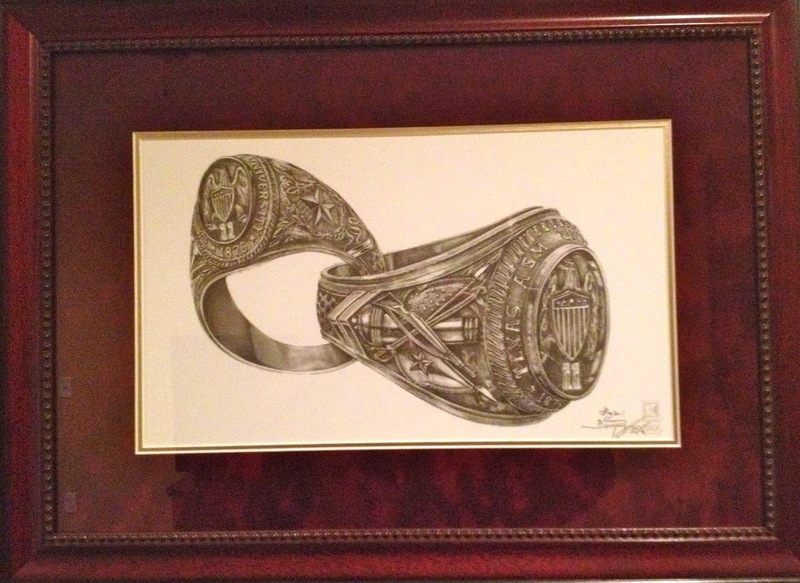 The one on the right is two Aggie rings with our class years on them. Can we go back to college pleaseee? 3. What's the worst gift Chelsea has ever given you? *pleads the fifth I asked this question because I am notorious for giving bad gifts, so he actually has quite a few to choose from. I really hoped he would answer because I would love to know which present takes the cake. Could it be the custom afghan with our faces on it? Could it be the homemade "100 reasons why I love you" collage? Could it be those history movies I thought he would enjoy that have never made their way into the DVD player? I guess we will never know. Seriously though, I learned with Parker to just stick to the list. He knows everything he is getting, and it's really for the best. I should not be left with any amount of creativity with this one. 4. What is your favorite gift that Taylor Grace received this year? Beanies a friend gifted us We were gifted the most beautiful handmade beanies for Taylor to wear. One was maroon and had "A&M" written on it, and the other was navy and white with an anchor. I so wish we could have seen her wear them, but we will save them for her future siblings to hopefully wear one day. My favorite gift was actually her first and only Christmas ornament. It's a crystal cross with the year 2014 written on it. It looks like it has light and angel wings coming out from the cross, and I love that it has the year she went to Heaven. We have been gifted some pretty amazing things for her! Those paintings are GORGEOUS! And the faces on the afghan thing made me laugh....sounds like something I would do! hahaha! Coal. That would be my husband's response if I tried asking him too. lol! Hahaha I love Parker's responses! The painting in your house are soooooo awesome! I think it's great that Taylor Grace has a Christmas ornament. That will be so cool to pull out every year. I am a bad gift giver too. Tom and I actually stopped exchanging gift and we will go on a shopping spree together after the holiday sales open so we can each get what we want. 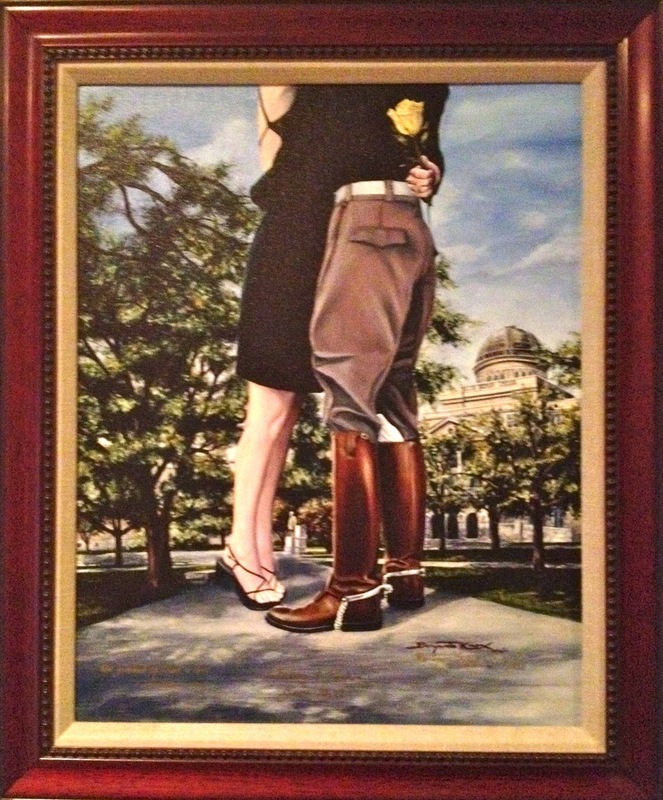 We have a Benjamin Knox painting of Kyle Field! It's my favorite, and I love that wherever we are stationed, we have a little something that reminds me of home. This was so fun. The prints are beautiful.